Stephen Westcott-Gratton has written a 'hit the nail on the head' how to book on putting in a Cottage Garden. It is obvious he is both gardener and writer because his advice is methodical and his suggestions very workable. He dispels the myth that English Cottage Gardens need to be contrived, reinforces the necessity for tight plantings and encourages the experimentation of different plants which provide the fun and color for this kind of garden. This book covers the history of the Cottage Garden and some of the plants traditionally used. It is both an enjoyable read and an informative tome for taking your small spot and turning it into a riot of color and a haven for life of all kinds. The plant selections are typical of someone who gardens in Canada, but that does not diminish the how to information the book provides. Plus, Mr. Westcott-Gratton definitely leans to the organic and that is dear to our hearts. 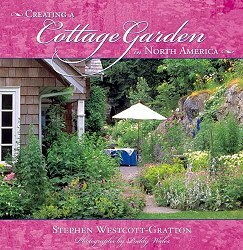 Other cottage garden books you might like.